Christmas is a time to reflect and be thankful for loved ones, friends and family. But for someone who is homeless or receiving end of life care in a hospice, the festive season can be a lonely and frightening time. 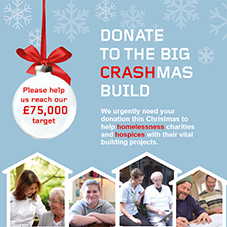 This Christmas we are asking you to donate to the BIG CRASHMAS BUILD, so we can continue to support homelessness charities and hospices with their vital building projects and create safe, secure and welcoming places that care for people when they are at their most vulnerable. In addition, if you donate over £2,000 your company logo and name will appear in our Thank You adverts which will run in industry media in the New Year. For donations over £600 your company name will appear in our Thank You adverts. CRASH is the construction industry’s charity. It is a unique, practical charity that assists homeless and hospice charities with construction related projects.